Getting a better sleep during third trimester is not as simple as one might think. There ares so many body changes during the last month of the pregnancy that a good night sleep becomes a rare occasion and requires some effort. Here are some sleeping tips for pregnant women at the third trimester, to help them gain a deeper night sleep. sleeping on the left side of the body might be better for late pregnancy month. Sleeping on the back or right side may have influence on the baby’s heart-rate and the blood flow cycle. Doctors will advice moms at the third trimester to sleep on their left side, which may be safer for the baby but less comfortable to the mom. 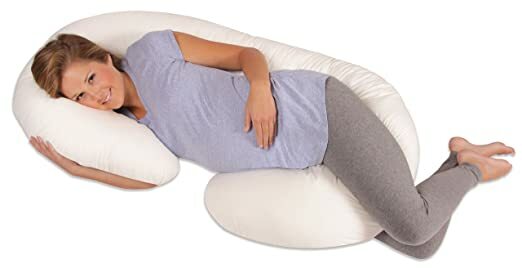 A full body pregnancy sleeping pillow might solve some of the inconvenience of the left side sleeping. Having enough exercise during the day may help pregnant women sleep better during the night. A pregnant mother can do mild exercise in order to have a better night sleep. Walking, stair climbing, swimming and other smooth type of exercises. Here are more feet and leg exercises for pregnant women. Having a folding thread mill at home can be a great solution since a pregnant mom can be active every day, and keep a 30 minute workout routine. There are some foods which you may want to avoid during your third trimester. Pregnant women should stay away from alcohol and caffeine especially 2-3 hours before their sleeping time. Another thing is to avoid heavy meals, oily and spicy foods. Those can contribute to the heartburns and ruin your sleep. Heartburns are a typical pregnancy symptom, and one way to help reduce this side effect is to raise the top of the bed slightly, or to lay on a pregnancy pillow. Just as it is recommended with babies, keeping a steady sleeping habit can help pregnant women at the third trimester sleep better at night. Having a regular sleeping hour and wake up time helps the body ‘send it self to sleep’. Avoid heavy meals, take a warm bath, wear comfortable pregnancy sleeping clothes, lower the lights, prepare a bed with pillows. Use a ‘white noise machine’ to help you sleep and over come other house noises. Athletes use such ‘white noise’ before tournaments when they have to make sure they sleep well. Many women at the third trimester say they have problem to roll over at night, here is a nice short video with clever tip for third trimester women rolling in bed. Sign in above to get handful of tips and pregnancy advice, add your comments below, all comments approved (unless spam), share this with other moms, help them! This entry was posted in Happy Pregnancy, Pregnancy Beauty, Pregnancy Symptoms and tagged can you sleep on your right side while pregnant, how to sleep better during pregnancy, pregnancy sleeping tips, sleeping on right side during pregnancy, Sleeping Tips In Your Third Trimester by admin. Bookmark the permalink.